This model is the Unknown Japanese Covered Wagon with 6 Horses in green with brown horses. The model has a two piece metal casting, 85mm in length. 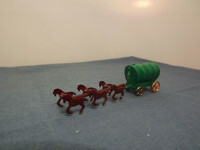 It has been molded with the drawbar and horses comprising one part and the covered wagon being the second part. 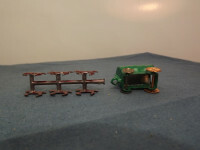 At the rear a very tin tinplate "end" has been soldered to the antimony body to represent the rear wagon flaps. The horses are very rudimentary "half" castings, attached to the drawbar, each only having two legs. There is no base as the rear casting of the wagon is hollow. The original wheels are gold metal, held in place by press fitting into a bent casting on the wagon. The wagon bears the legend "Japan" on the left hand lower side. The item comes in a distinctive, small, pale green card box. 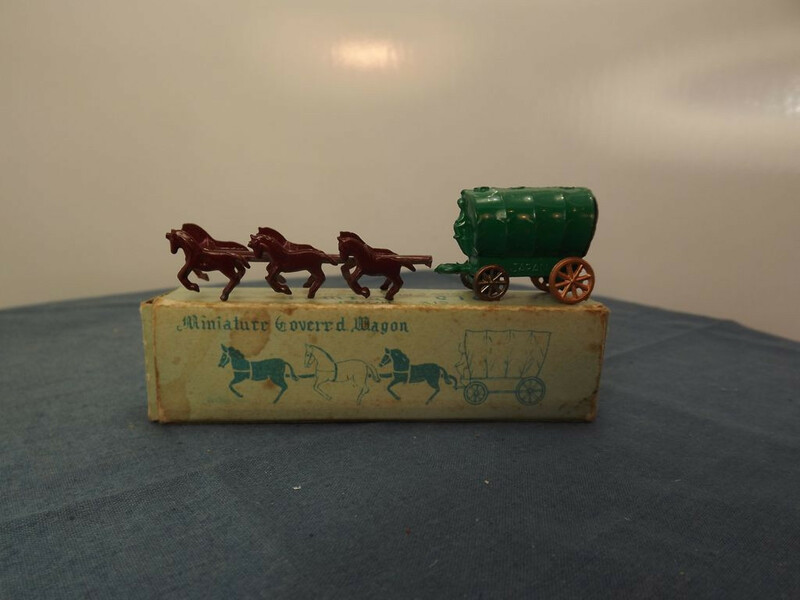 The top and bottom faces show a line drawing of the wagon and horses over which is "Miniature Covered Wagon" in an Olde English script. The other two sides are marked "Six Horse, Old Timer, Covered Wagon, with, Four Moving Wheels, Hand painted Animony Japan" on six lines. one side carries a hand-written price of "25c". The end flaps are blank. I do not know exactly when this item was issued but it would have been between the late 1950s and the late 1960s.